On Top of the World's sprawling amenity campus and affordable homes have made it a hit among active adults. For the fourth year in a row, 55places.com is excited to announce its list of the best-selling active adult communities across the country. This list of the 50 best-selling communities comes from data based on the number of sales through 55places.com in the last 12 months, from March 1, 2018, to February 28, 2019. Since the list is based on sales made through the website, it does not represent overall sales in any given community. However, this list does show where 55places.com readers are buying their next homes. In order to keep track of your favorite communities, you’ll want to make sure you’re signed up for a 55places.com User Account. Keep reading to find out which active adult communities made the best-selling list for 2019. OTOW consistently ranks high because of its blend of affordability and amenities. We’ve said it before and we’ll say it again: On Top of the World is truly on top of the world for many 55places homebuyers. 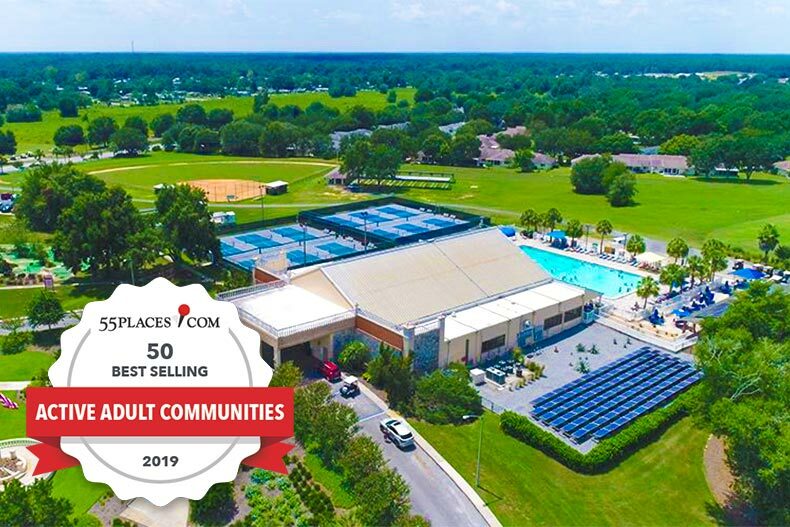 This age-restricted community in Ocala, Florida earns the distinction as 55places.com’s best-selling community of 2019. On Top of the World has long been a popular choice, but sales have continued to increase from last year’s No. 4 best selling to this year’s No. 1 spot. So why do active adults looking for homes for sale in Central Florida continue to choose On Top of The World more than any other community? With plans for 10,000 single-family and attached homes, On Top of the World will be the third-largest 55+ community in Florida upon completion. But even with its grand size and world-class amenities, the homes manage to stay affordable for many active adult homebuyers. The superior selection of amenities truly makes this 55+ community stand out. The expansive lineup features three golf courses, two restaurants, several clubhouses, fitness centers, swimming pools, and tennis and pickleball courts. With attractive amenities that appeal to almost every interest, hobby, and passion, many active adults feel right at home at On Top of the World. There's plenty to do in Sun City Hilton Head, but if you need to leave Hilton Head Island is just minutes away. Sun City Hilton Head in Bluffton, South Carolina may have been surpassed this year, but this resort-style community still remains one of the best-selling communities. 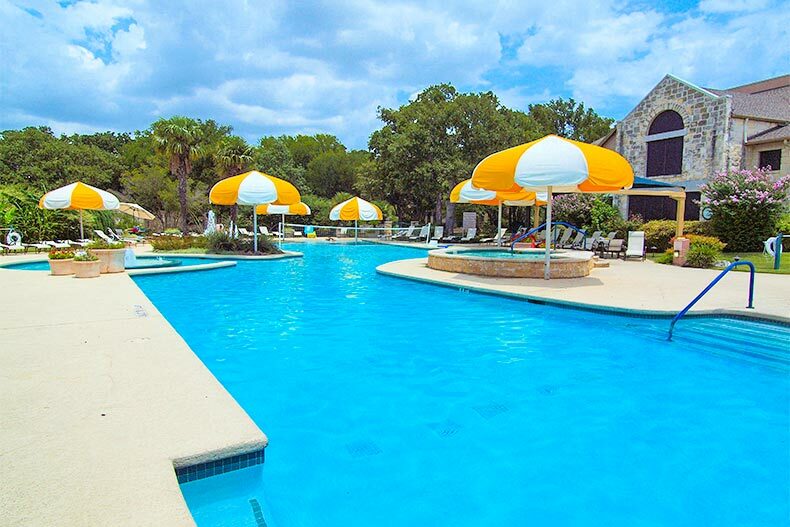 For active adults who want to retire along Coastal South Carolina and enjoy pristine beaches, mild weather, and diverse outdoor recreation, Sun City Hilton Head often has everything they’re looking for. As a Del Webb community, Sun City Hilton Head offers a luxurious amenity-rich lifestyle. 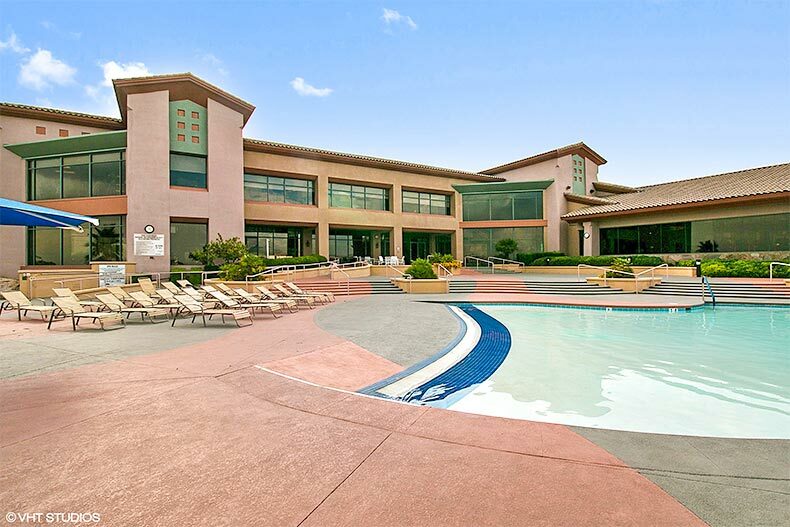 The exceptional amenities at this 55+ community center around a 45-acre Village Center and amenity campus. Residents can make use of three fitness centers, three 18-hole golf courses, four outdoor resort-style pools, a 20-acre fishing lake, and courts for tennis, pickleball, bocce, and volleyball. Additional features include a dog park, gardening plots, RV storage, and studios for ceramics, sewing, woodworking, art, and photography. With homes for sale that range from 1,000-square-foot attached townhomes to 4,000-square-foot single-family homes, active adults can choose from a diverse array of styles and floor plans to make the most out of life at this 55+ community. But you don’t have to take our word for it: see what residents love about Sun City Hilton Head. 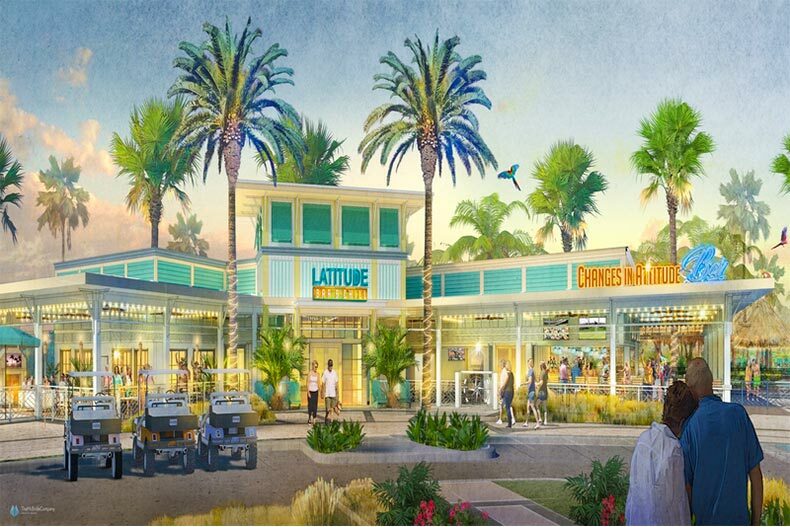 Latitude Margaritaville has taken the active adult world by storm. It's only going to get more popular when amenities like the Latitude Bar & Chill open soon. With so much excitement around Latitude Margaritaville Daytona Beach, we named it the 55places.com Community of the Year for 2018. That popularity shows no signs of slowing down as more and more active adults fall in love with the resort-style amenities and laid-back lifestyle offered by this slice of paradise on Florida’s Atlantic Coast. The impressive amenities in Latitude Margaritaville Daytona Beach help make the beach-inspired lifestyle a reality for residents. A Town Center will serve as the epicenter of all activity in the community, hosting live music, entertainment, and gatherings. It will be surrounded by a state-of-the-art fitness center, dog park, theater, business center, and the Latitude Bar & Chill Restaurant. If residents want more than the indoor lap pool and outdoor resort-style swimming pool, a shuttle service will deliver them to a private beachfront club. Although resale homes recently became available, this 55+ community offers homebuyers the opportunity to build the brand new home of their dreams. Developer Minto has even partnered with furniture company Ethan Allen to offer design packages on the themes of Beach House, License to Chill, Son of a Sailor, and In Paradise. These new construction homes will be some of the best new homes available in Daytona Beach. Sun City Texas proves everything really is bigger in Texas. A low cost of living, sunny climate, and vibrant culture are all reasons why so many retirees move to Texas. But it’s also thanks to the state’s top-notch active adult communities, like the best-selling Sun City Texas in Georgetown. The combination of Del Webb luxury and Texas grandeur make this 55+ community popular with active adults who want to retire in the Texas Hill Country. The opulent amenities at Sun City Texas help residents make the most of their free time. The Village Center amenity complex boasts 86,000 square feet of amenity space. It features a restaurant, cafe, indoor walking track, two indoor pools, a ballroom, and studios for ceramics, stained glass, sewing, and woodworking. 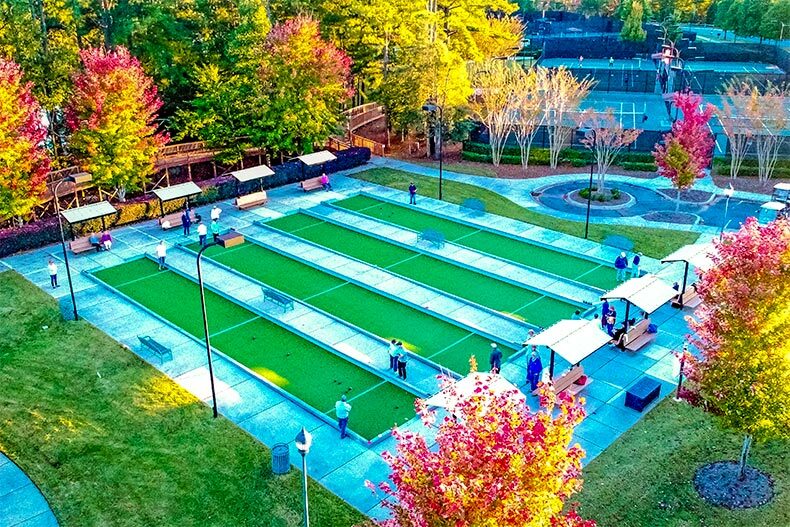 The outdoor amenities continue with two resort-style pools, a dog park, a picnic pavilion, and courts for pickleball, tennis, bocce, and shuffleboard, plus three 18-hole golf courses. Some of the homes for sale even have golf course views, but with such a variety of home models to choose from, active adults can find the home and the view that suits them best. Most homes consist of two or three bedrooms, two bathrooms, and a two-car garage, but the home sizes can increase from there with custom upgrades and features. Living in Solivita means an extensive list of clubs, resort-style amenities, and being near Orlando. The high-quality lifestyle at Solivita in Kissimmee, Florida includes golf-cart-friendly streets, Tuscan-inspired homes, and amenities that make the most of the state’s pleasant weather. Its location in Central Florida means that residents can visit world-class attractions like Universal Studios, Kennedy Space Center, and Walt Disney World, plus travel the world and visit the family from the Orlando International Airport. Over 150,000 square feet of amenities give this 55+ community an elegant feel. The Palms Amenity Complex and Riviera Spa and Fitness Center serve as the hub of activity, with fitness centers and exercise studios, multi-purpose rooms, and indoor and outdoor swimming pools. Unique to this community, the Waterfront Galleries art center invites residents to enjoy creative and leisurely pursuits. The 18-acre sports complex, Freedom Park, features an outdoor pavilion and dog park in addition to sports courts. The homes for sale in Solivita represent the diverse sizes, styles, and floor plans available to homebuyers. The two collections of attached homes all feature at least two bedrooms, two bathrooms, and spacious one-and-a-half car garages. The single-family homes range from 891 to 3,057 square feet, allowing happy homebuyers to find an ideally sized home for their needs. Florida, Arizona, and Texas may all come to mind as popular retirement destinations, but many active adults who want something a little different choose to retire in Tennessee. The active lifestyle community Tellico Village in Loudon jumped from No. 47 on last year’s list to No. 6 this year, indicating that more and more homebuyers seek out the active lifestyle and outdoor recreation offered by Tennessee. This active lifestyle community may not have an age restriction, but many active adults enjoy living in an amenity-rich neighborhood with a large population. With three recreation centers, three golf courses with clubhouses, and a private country club, it’s clear that active adults can make the most of the community’s amenities. Across several clubhouses, residents can enjoy indoor and outdoor swimming pools, fitness centers with studios and saunas, meeting rooms, lounges, restaurants, tennis courts, pickleball courts, and three golf courses. The waterfront location on the Little Tennessee River means that many of the amenities have scenic lakefront views. With construction still underway on this 3,375-home community, homebuyers can choose new construction custom homes or resale homes for sale. The resale homes include townhomes and single-family homes that feature first-floor master suites, attached garages, and low-maintenance exteriors. Active adults who daydream about spending hours on the shore will be happy to know that Kings Point in Sun City Center, Florida is located less than 10 miles from several Tampa Bay beaches, including Bahia Beach and Apollo Beach Preserve. But Kings Point has a lot more to offer than its convenient location near the bay and equidistant between Tampa and Bradenton. Many of the community’s 5,277 homes are attached villa condominiums arranged in duplex configurations. These attached homes for sale offer the benefit of low-maintenance exteriors, which allow homeowners to spend more time enjoying their hobbies. Ranging from about 800 to over 2,000 square feet, the condominiums can still offer plenty of living space with luxurious upgrades. The Estate Homes collection features two single-family home models. The 97,000 square-foot Kings Point Clubhouse and the 29,000 square-foot Kings Point South Clubhouse boast popular amenities like a fitness center, cafe, and several indoor and outdoor swimming pools. Some of the more unique offerings include cyberspace rooms, a stained glass studio, and a floating fishing dock. The clubhouses feature plenty of gathering space for lifestyle clubs, which include chorus, Audubon, meditation, travel, creative writing, and many more. 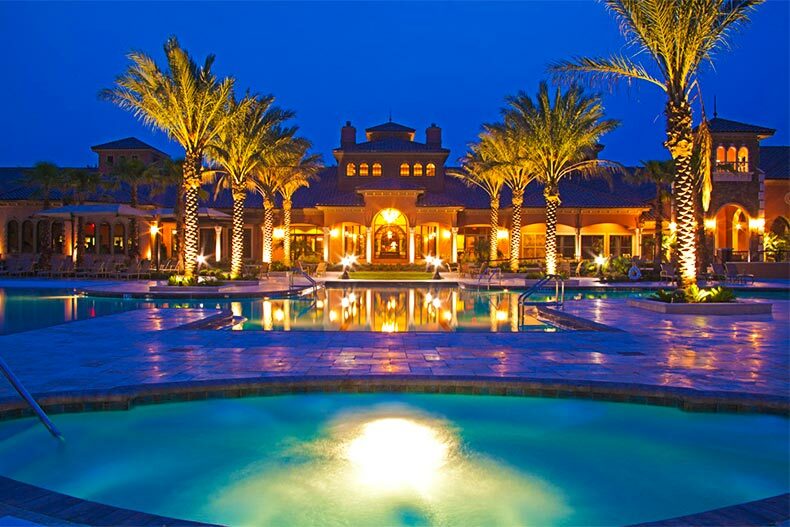 Del Webb Ponte Vedra in Ponte Vedra, Florida is an up-and-coming and best-selling active adult community in the Jacksonville area. This gated 55+ community is located just 20 miles south of Jacksonville and just a few miles from Atlantic Coast beaches. 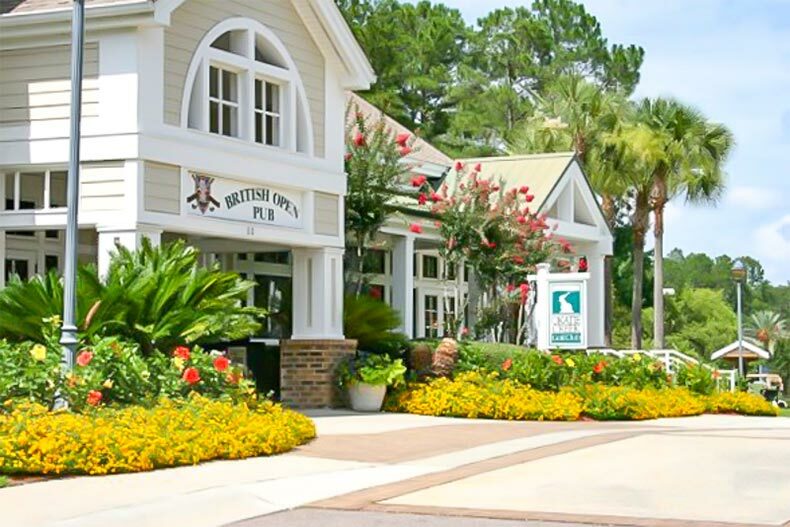 Del Webb Ponte Vedra also enjoys a location within the master-planned Nocatee development, which means that residents have their own private age-restricted amenities plus all of the amenities found throughout Nocatee. The exciting amenities start with the Anastasia Club, the 37,800-square-foot clubhouse. The state-of-the-art fitness center with an aerobics studio, an indoor pool, spa, steam room, and sauna is a highlight for those who want to stay physically active. The clubhouse also has an arts and crafts studio, lounge, cafe, catering kitchen, library, and a grand ballroom. Outdoors, residents can find a resort-style pool with a sundeck and spa, a barbecue pavilion, two event lawns, and a six-mile nature trail. Renowned builder Del Webb made sure to offer plenty of diverse home models to choose from, including single-family, condominium, and carriage homes. Many of the homes for sale feature upgraded gourmet kitchens and stylish Mediterranean-inspired architecture. The best-selling active adult community in North Carolina, located along the coast in the Wilmington area, is Brunswick Forest in Leland, NC. With plans for 8,000 single-family and attached homes, this active lifestyle community will be one of the largest in the state upon completion. The adventurous outdoor amenities found throughout Brunswick Forest include more than 40 miles of paved and unpaved walking and biking trails. Residents can contribute to the community gardens or canoe, kayak, or go boating on the Intracoastal Waterway and Cape Fear River. 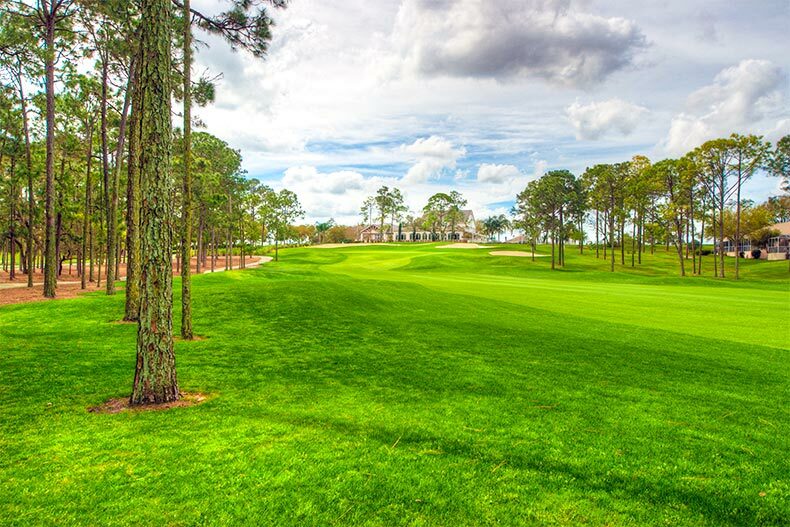 Golfers will relish the Cape Fear National Golf Course, which offers 18 holes of distinguished championship golf. In addition to outdoor amenities, the Fitness & Wellness Center provides 18,000 square feet for physical activity, with a state-of-the-art fitness center, aerobics studio, locker rooms, and swimming pools. The low-maintenance lifestyle appeals to many active adults because they can free themselves from traditional home upkeep. The available home models include elegant townhomes, coastal cottages, and well-appointed single-family homes. The homes for sale range from about 1,100 to over 3,500 square feet with desirable features like spacious master suites, screened-in porches, open floor plans, and oversized garages. The southern charm of Savannah Lakes Village in McCormick, South Carolina can be felt throughout the active lifestyle community, from its tight-knit feel to its inviting clubs and events. Even as a larger development with 4,800 planned homes in several neighborhoods, the residents make it feel like a community. Those who love the great outdoors will find plenty of ways to pursue their hobbies with the engaging amenities in Savannah Lakes Village. The community includes 25 miles of shoreline and direct access to Lake Thurmond. This 71,000-acre lake is ideal for fishing, boating, kayaking, and swimming. There are also miles of walking and biking trails. Sports enthusiasts can play on two 18-hole golf courses with practice facilities, plus courts for tennis, pickleball, and bocce ball. The 23,000 square-foot recreation center provides even more amenities, as well as multi-purpose rooms for events and social clubs. Some of the offerings include geocaching, book club, art classes, and outdoor adventure club. For a desirable indoor-outdoor connection, homebuyers can browse homes for sale with scenic views of golf courses, forests, or the lake. All of the single-family and attached home models feature at least two bedrooms, two bathrooms, and attached garages. Active adults looking to downsize in Coastal South Carolina will find a lot to love about Lakeside Crossing in Conway, SC. In addition to low-maintenance new and resale homes for sale, this 55+ community boasts a location just 10 miles from the fun and sun of Myrtle Beach. Province gives residents a chance to live among nature and still be near Phoenix. Located 35 miles south of Downtown Phoenix, Province in Maricopa, Arizona is the state’s best-selling 55+ community of the year. With a planned 2,217 single-family and attached homes, this larger active adult community features a 32,000 square-foot clubhouse with indoor and outdoor swimming pools and a cafe. With a 70,000-square-foot clubhouse, a 38-acre nature preserve, and 27 holes of championship golf, Pelican Preserve in Fort Myers, Florida is stocked full of sought-after amenities. Its location in the Fort Myers-Cape Coral area also suits homebuyers who want to enjoy Southwest Florida. Some of the unique features at Rossmoor in Walnut Creek, CA include the community’s own weekly newspaper, television channel, and recreation department that arranges over 200 lifestyle clubs and social events. The five spacious clubhouses include amenities like restaurants, swimming pools, exercise facilities, and a 150-seat theater. 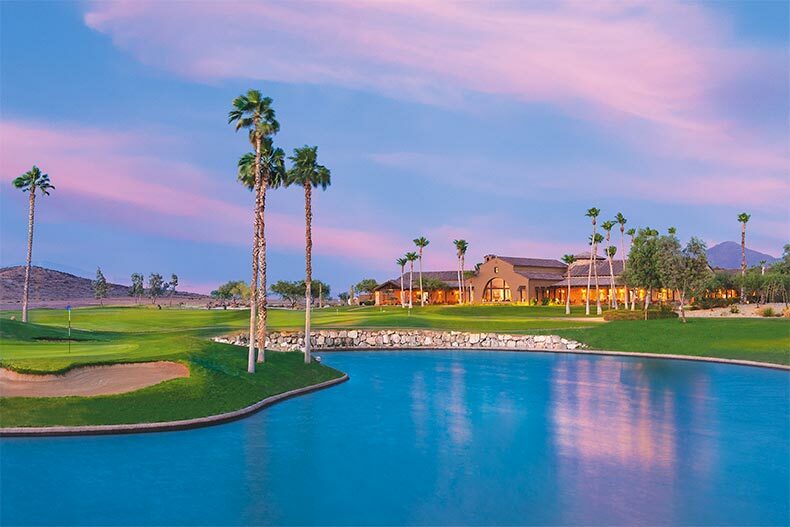 Although it landed at #50 on last year’s best-selling list, Sun City Grand in Surprise, Arizona has clearly gained more attention since then. With abundant amenities and a variety of homes for sale, active adults who want to retire in northwest Phoenix should check out this Del Webb community. Sun City Lincoln Hills remains one of the most popular California 55+ communities. 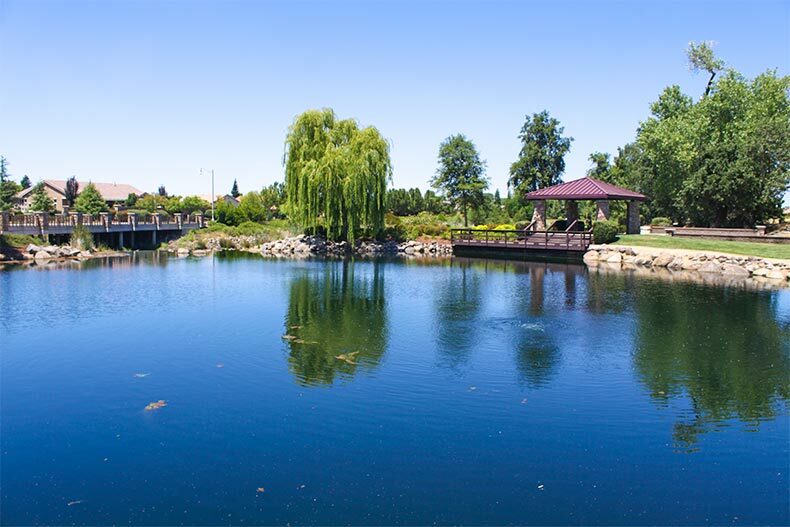 Residents of Sun City Lincoln Hills in Lincoln, California live within 30 miles of Sacramento International Airport, Downtown Sacramento, and Folsom Lake State Recreation Area. Within the community, active adults make use of amenities centered around a 68,000 square-foot clubhouse that hosts dozens of social gatherings and clubs. The best-selling 55+ community in Summerfield, a small town situated south of Ocala, is Spruce Creek Country Club. With amenities like three clubhouses and 36 holes of golf, plus updated single-level homes for sale, this Del Webb community feels like a hidden gem in Central Florida. New Jersey includes over 260 active adult communities, but only one can be the best-selling. This year, it’s Holiday City at Berkeley in Toms River, NJ. As the state’s largest 55+ community, homebuyers move here for the low-maintenance residences surrounded by amenities found throughout the development’s five neighborhoods. At Sun City Peachtree in Griffin, Georgia, residents can live an active lifestyle near Atlanta, but within a more peaceful town. This 55+ Del Webb community boasts a luxurious 45,000 square-foot amenity center and outdoor amenities that include a swimming pool, 18-hole golf course, and scenic walking and biking trails. In 2015, builder K. Hovnanian began construction of Four Seasons at The Lakes of Cane Bay in Summerville, South Carolina. Upon completion, this 55+ community will consist of 800 single-family homes designed for active adults looking for brand new homes for sale in the Charleston area. 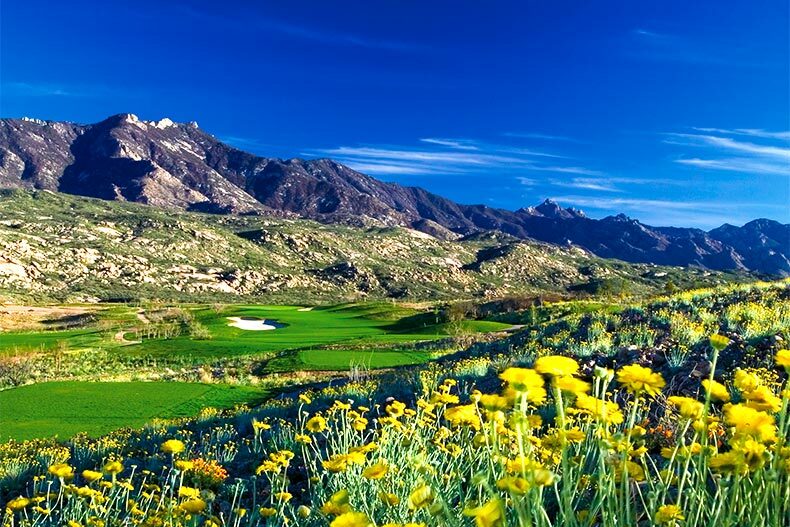 If golfing among mountains sounds like a good daily activity, perhaps SaddleBrooke is for you. The 40+ age restriction at SaddleBrooke in Tucson, Arizona appeals to active adults who want to live in a community with a lower age restriction that still has world-class amenities. In addition to its luxurious homes, SaddleBrooke offers a 28,500 square-foot clubhouse, a performing arts center, and three outdoor pools. Sun City Festival in Buckeye, Arizona rose from No. #44 to No. #22 on the best-selling communities list as more homebuyers found this suburban sanctuary. The Del Webb community features updated homes for sale, resort-style amenities like the Sage Recreation Center, and close proximity to both Phoenix and natural desert landscapes. As the largest active adult community in the Chicago area, Sun City Huntley consists of 5,489 single-family, attached, and condominium homes across 2,300 acres. With some of the best amenities in the Midwest, the 94,000 square-foot Prairie Lodge features a restaurant, performing arts center, and swimming pools. Clearbrook in Monroe, New Jersey puts residents within 90 minutes of Atlantic City, Philadelphia, and New York City, ideal for active adults who want to visit nearby family or travel. Affordable homes allow residents to join this 55+ community and use well-appointed amenities centered around two clubhouses. Homebuyers interested in Stone Creek in Ocala, Florida can choose from a variety of new and resale homes for sale. With a low-maintenance lifestyle, active adults have more time to lounge in the indoor and outdoor swimming pools, play tennis and pickleball, and join social clubs. With affordable attached homes for sale, two clubhouses surrounded by amenities, and a low-maintenance lifestyle, Leisure Village in Lakewood, New Jersey appeals to many active adults who want to retire in Ocean County. The location near Route 70 also puts residents close to beaches and the bay. Located in popular Fort Mill, amenities in Sun City Carolina Lakes are expansive and modern. The 55,000-square-foot Lake House clubhouse, which includes indoor and outdoor pools, an indoor walking track, and a coffee shop, is just one reason why homebuyers choose Sun City Carolina Lakes in Fort Mill, South Carolina. This sought-after Del Webb community also provides luxurious single-family and attached homes near Charlotte, NC. Started by Del Webb in 1960, the original Sun City in Arizona has maintained its popularity throughout the years. This 55+ community of 27,492 residences has the affordable homes, countless amenities, and the pleasant Arizona climate that keep active adult homebuyers coming back for more. The resort-style amenities at Oak Run in Ocala, Florida span from six swimming pools to 16 shuffleboard courts, with plenty more indoor and outdoor amenities to keep residents socially and physically active. An on-site activities director coordinates lifestyle clubs such as penny poker, canine club, and line dancing. Just two-and-a-half miles west of the original, Sun City West offers another option for reasonably priced homes and abundant amenities in an Arizona 55+ community. Residents here can traverse the golf-cart-legal streets to access health care, banks, and churches, plus amenities like golf courses and recreation centers. Henderson's affordability and location near Las Vegas is a big draw for active adults. Sun City Anthem in Henderson, Nevada features a variety of homes for sale and a clubhouse with 77,000 square feet of resort-style amenities. Its location just south of Las Vegas allows residents to access world-class entertainment and casinos while retreating away from the traffic and noise. About 80 miles northeast of Las Vegas, Sun City Mesquite provides even more tranquility than other 55+ communities closer to the city. Residents make the most of the average 300 days of sunshine each year by enjoying the amenities, swimming, and playing golf, tennis, pickleball, bocce, and more. Recently completed in 2017, Del Webb at Cane Bay in Summerville, South Carolina consists of 1,000 affordable single-family homes just 25 miles north of historic Charleston and the Atlantic Coast. Amenities include a 20,000 square-foot clubhouse, resort-style pool, state-of-the-art fitness center, and a sundeck with a fire pit. A temperate climate, abundant outdoor recreation, and active music scene all make Tennessee a retirement destination, especially with 55+ communities like Del Webb Lake Providence in Mt. Juliet. In addition to a 24,000-square-foot clubhouse, amenities include five miles of walking trails, a 15-acre fishing lake, and an event lawn. 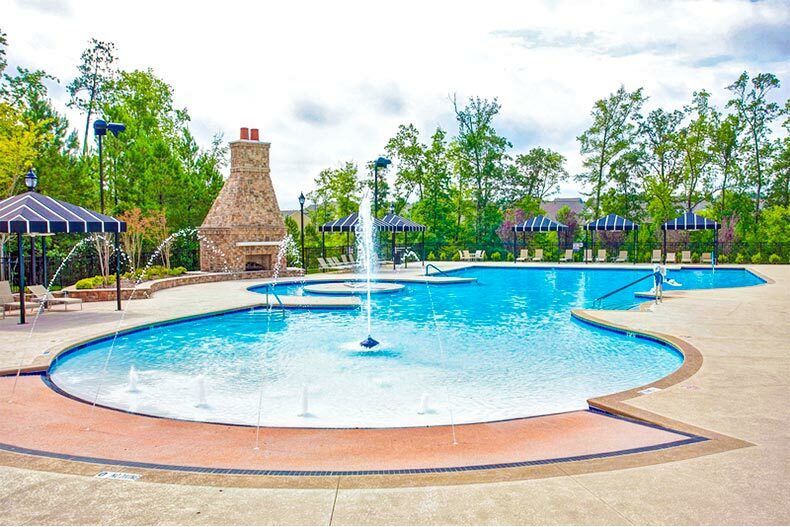 Another Carolina Del Webb makes the list for its range of amenities and ideal location. Active adults looking for new homes for sale in a Del Webb community should take a look at Carolina Arbors in Durham, NC. The low-maintenance, single-family homes allow residents to live in comfort while enjoying resort-style amenities like a 37,000 square-foot clubhouse with an indoor pool, fitness center, and bar. The Dallas-Fort Worth Area boasts 30 active adult communities, and many homebuyers have been choosing Frisco Lakes in Frisco, Texas. The upscale amenities feature the 28,000 square-foot Village Center, 10,000 square-foot golf center, and several outdoor pools and patios, all within reach from the community’s reasonably priced single-family homes. Las Vegas may be known as the entertainment capital of the world, but its premier active adult community, Sun City Summerlin, is not to be outdone. The community features three golf courses, four clubhouses, three restaurants, and even more amenities that make it feel like a world-class resort. Homebuyers take a closer look at Carillon in Plainfield, Illinois because of its reasonably priced single-family, attached, and condominium homes that suit a variety of needs. The 55+ community also offers plenty of amenities, including the 32,000 square-foot Club Carillion with three swimming pools and a grand ballroom. 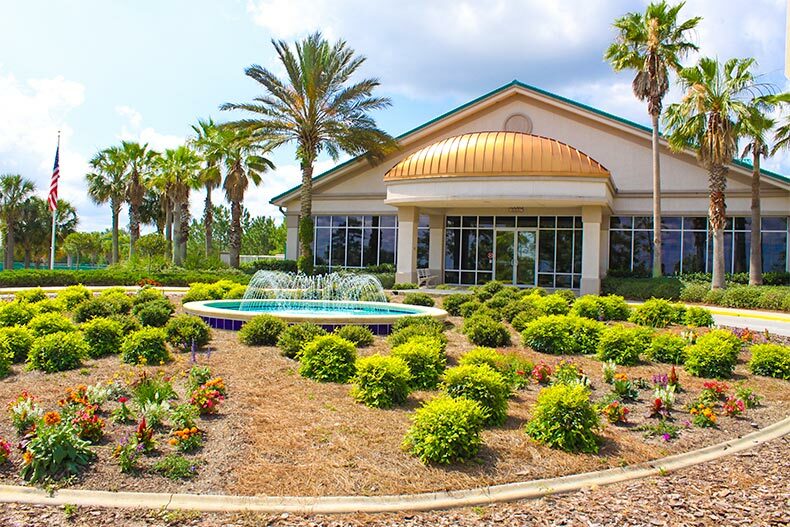 Surrounded by palm trees and tropical landscaping, the 40,000 square-foot clubhouse at Valencia Lakes in Wimauma, Florida serves as the activity center of this 55+ community. This best-selling Tampa Bay Area community also features amenities like courts for tennis, pickleball, and bocce, plus a community garden and RV parking. Twin Lakes in St. Cloud, Florida lives up to its name by creating resort-style amenities along the banks of Live Oak Lake, including a 20,000 square-foot clubhouse with a restaurant and bar, a fitness center, and a ballroom. Homebuyers can choose from ten single-family and attached home models. 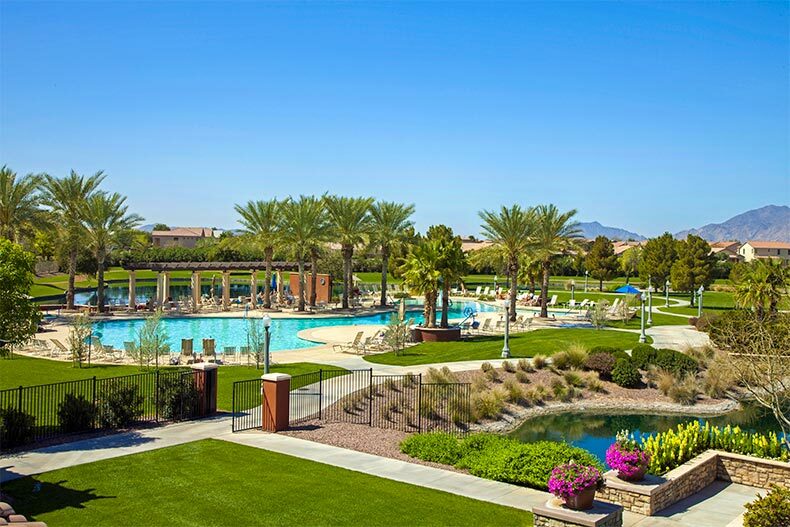 Robson Ranch provides a resort-like atmosphere with easy access to Phoenix and Tucson. Active adults who want a home in Arizona can enjoy both Phoenix and Tucson from Robson Ranch in Eloy. Located halfway between the cities, Robson Ranch consists of affordable single-family and attached homes with access to amenities like a 39,000 square-foot clubhouse with studios for woodcarving and ceramics. California’s Inland Empire has long been a retirement destination for active adults, thanks in part to the abundance of 55+ communities there, such as Four Seasons at Beaumont. This exclusive gated community has modern homes and world-class amenities, including two recreation centers and a sports complex. Robson Ranch in Denton invites 40+ active adults to join its community that will include 7,200 single-family and attached homes upon completion. Designed to encourage residents to stay active, the impressive amenities include two clubhouses, a technology center, and a golf club with a restaurant. The Palm Springs area of California is known for its resort-style living, especially with active adult communities like Four Seasons at Terra Lago in Indio. This K. Hovnanian neighborhood will include just 682 single-family homes upon completion, creating a tight-knit community of upscale homes with access to world-class amenities. As one of the largest 55+ communities in Texas, interest in Hill Country Retreat in San Antonio shows no sign of slowing down. Active adults seek out this community for its luxurious single-family homes, proximity to outdoor recreation, and the expansive lineup of amenities that includes two swimming pools. Timber Pines impeccably managed golf course is a big hit among homeowners. The prime Gulf Coast location of Timber Pines in Spring Hill, Florida means that residents can spend a few hours at the beach whenever they want. In addition to a convenient location, this gated golf community includes affordable homes for sale and plenty of adventurous amenities beyond golf. Located in New Jersey’s Ocean County, Leisure Village East in Lakewood offers an affordable opportunity to live in a 55+ community. The attached homes allow active adults to downsize into a low-maintenance lifestyle, while the amenities that include a fitness center, 9-hole golf course, and walking trails keep residents active. The master-planned Estrella development in Goodyear, Arizona includes the 55+ community CantaMia. The 1,700 home sites feature new and resale homes for sale that give residents access to all of the amenities found throughout Estrella and the age-restricted community, including a private clubhouse. The lifestyle provided by Cameron Grove in Upper Marlboro, Maryland allows residents to live in a peaceful 55+ community within 30 miles of Washington, D.C. and the Chesapeake Bay area. Many of the homes for sale feature low-maintenance exteriors and functional floor plans in single-family, attached, and condominium residences. From the clubhouse slated to open Summer 2019 to the brand-new homes, almost everything is new at Del Webb Southern Springs in Spring Hill, Tennessee. This up-and-coming Del Webb community will consist of 602 single-family homes across 309 acres for an intimate feel with plenty of resort-style amenities. If any of these 50 best-selling communities have grabbed your attention, call 55places at 866-270-4495 for more information. You can also sign up for a 55places user account and favorite any of these communities on their community pages, or sign up for our newsletter below.